B&P Lamp Supply of McMinnville, Tenn., is recalling about 3,000 Golo lamp sockets. 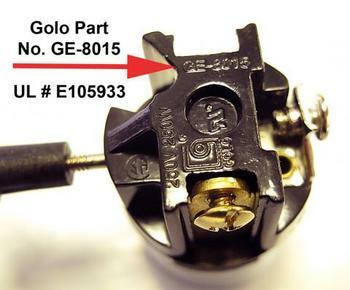 This recall involves Golo brand 3-way turn knob lamp sockets with part number GE-8015. The lamp sockets are brown. Golo, GE-8015 and 250V 250W are stamped on the top of the sockets near the wire terminals. These 3-Way Lamp Socket interiors were sold individually as a replacement/repair part only. This socket interior is a medium (E26) size lamp socket. The lamp sockets were sold at lamp shops, lamp shade shops and lamp repair shops nationwide from May 2017, through December 2017, for about $2. Consumers may contact B & P Lamp Supply at 800-822-3450 from 7 a.m. to 5 p.m. (CT) Monday through Friday, by email at marcia@bplampsupply.com or online at www.bplampsupply.com and click “Important Product Recall” for more information.